It used to be easy. The Heavyweight Champion of the World was the man who beat the man, who beat the man, who beat the man, etc. Simple. Of late, though, with multifarious governing bodies each nominating their own champion, it became a lot more complicated. If we take things back to more sedate times though, 1967 to be precise, and lean on that old boxing maxim a little, there’s a way to rationalise how Scotland could have laid claim to the world crown. On 30 July 1966, England lifted the Jules Rimet Trophy and were anointed as champions of the world. 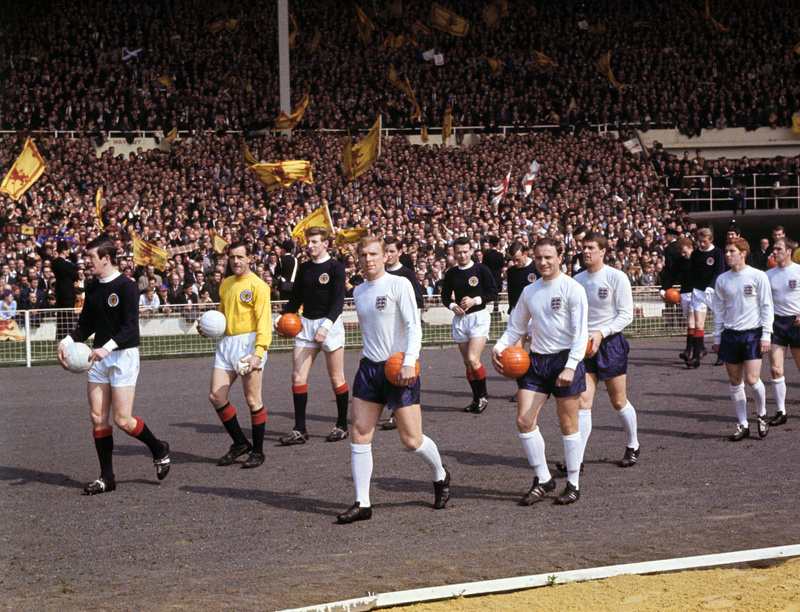 Nine months later, they had extended their unbeaten run of games to 19, and on 11 April 1967, faced Scotland in a Home Internationals fixture that also doubled as a qualifier for the 1968 European Championship. It was a game that would enter sporting folklore north of the border, feeding many a dewy-eyed reminiscence whenever football fans gathered, bedecked in tartan. It was a day when Scotland travelled to Wembley and defeated the reigning world champions in their own back yard. It was a great day to be Scottish. The team that Alf Ramsey sent out to face the Scots was very much the strongest available to him. Ten of the 11 that lifted the still gleaming Jules Rimet back in July of the previous year turned out again. The only change was Jimmy Greaves stepping for Roger Hunt. It was a formidable outfit, but Scotland lacked little in comparison. Bobby Brown, the former St Johnstone manager, had been appointed to head up the national team, and the clash with the Auld Enemy would be his first game in charge. Although Brown, a goalkeeper in his playing days, had seen out much of his career between the sticks for Rangers, he had started his career at Queen’s Park, before moving to Ibrox after the Second World War. 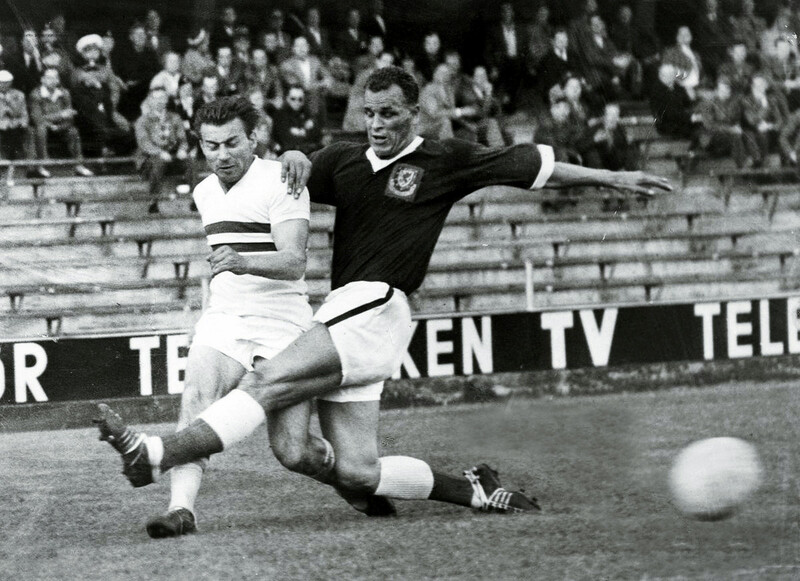 During his time at Hampden, his understudy had been Ronnie Simpson, who eventually went on to join Celtic and became one of the famed Lisbon Lions a month after the Wembley encounter. In what was at the time a controversial selection, Brown opted to give Simpson his international debut – at the ripe old age of 36 – in the England game, selecting the veteran ahead of the popular incumbent, Bobby Ferguson of Kilmarnock. The fact that the last Celtic goalkeeper to turn out for Scotland at Wembley – Frank Haffey, six years previously – had conceded no less than nine times may have flavoured the fans’ concerns somewhat. Simpson was joined by three other Celts in Tommy Gemmell, Willie Wallace and Bobby Lennox. Two others, Bobby Murdoch and wing wizard Jimmy Johnstone, were unavailable, but would otherwise surely have been in contention to increase the Celtic contingent to half-a-dozen. All six would feature for Jock Stein’s team that would become European champions against Internazionale a few weeks later. Losing Murdoch and Johnstone was less than ideal, but the remainder of Brown’s team was still strong. The Rangers pair of McKinnon and John Greig were a formidable unit. The former had taken the place of injured Celtic skipper Billy McNeill, and such had been the form of the Rangers man that, once fit again, the Hoops defender couldn’t regain his place. This was also the time when no self-respecting English club failed to have a quota of Scots in their squads. The Anglos of Chelsea’s Eddie McCreadie, Billy Bremner of Leeds, debutant Jim McCalliog of Sheffield Wednesday, Sunderland’s Jim Baxter and the incomparable Denis Law of Manchester United completed the line-up. Old Trafford legend Law was reported to be particularly keen to deliver against England. Famously, he had decided to go out and play golf rather than watch England compete in the World Cup final, allegedly exclaiming “bastards!” upon hearing the result. That frustration and the undoubted ribbing Law and his fellow Anglos would have endured in dressing rooms up and down the country would have had the team stoked up. 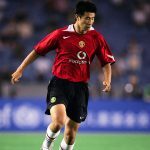 For all that, though, the reality of how the game was played out perhaps fits ill with the popular legend of a Scotland team travelling down south to hand out a football lesson fuelled by raw passion and fraternal competitiveness, and assure England that they were not the best team in the world. A full film of the encounter is widely available online, and watching it paints an entirely different picture. Passages of the game were played at a fairly sedate pace – even taking into account any comparison with the frenetic thud and blunder of the contemporary game. The crowd did little to inject any particular passion into the proceedings and there was not a single booking recorded by German referee Gerd Schulenburg in the entire game, although some challenges probably warranted such punishment. Perhaps the key element in deciding the game came just after ten minutes, when a challenge between Jack Charlton and Bobby Lennox left the Leeds defender hobbling. Suffering from a broken toe, Charlton limped from the field and England were reduced to playing with ten men. Four minutes later, although clearly still struggling to even break into a trot, Ramsey sent the Leeds defender back out onto the pitch. With no substitutes available, the only option was to throw the defender upfront for what was often termed at the time as offering “nuisance value.” Nobby Stiles was dropped back alongside Bobby Moore to fill the gap. From then, England were effectively playing with ten men, although such an assessment must be mitigated by the fact that Charlton would still play a significant part in the goal-scoring action of the game later on. Things may actually have been worse for Ramsey’s men if a passage in Greaves’ autobiography is to be taken as valid. In it, the Spurs marksman relates that as well as being hamstrung by the hobbling Charlton, England also suffered as full-back Ray Wilson became a passenger for the remainder of the game after being caught late by Bremner. Whatever the truth of that, it’s without question that Scotland appeared to be the team in command of the early passages of the game, and it would have been of little surprise when they went ahead on 27 minutes. A few minutes earlier, a Wallace cut-back from the byline had been squandered by Law, but when Gordon Banks failed to hold a relatively tame shot, Law made no mistake, netting the loose ball before spinning away in his typical pose, arm raised in triumph. It must have been a sweet moment for the Manchester United star. Not quite a hole in one, but certainly a hole in England’s aspirations. The goal seemed to serve as a wake-up call for the home team, and ahead of the break, they started to create some dangerous attacking play. The largely immobile Charlton missed a good headed chance, before a Martin Peters effort produced a similar outcome. At the break, and although Scotland had been the better side, England were still in the game, and just after the restart, could have equalised. The second period was barely underway when Alan Ball set off on a run, taking him deep into Scottish territory. The ball then came to Charlton. His close-range effort may well have crossed the line, but with no goal-line technology – or an Azeri linesman to rule for England – the appeals were summarily dismissed and the game moved on. Although Scotland were still on top, England pressed on for an equaliser. Bobby Charlton fired a shot over Simpson’s bar and a Peters’ header followed a similar trajectory. Jack Charlton saw a goal-bound effort diverted over by John Greig’s timely interception. This was certainly no stroll in the park for Scotland, but when the goal came, it was at the other end of the field. 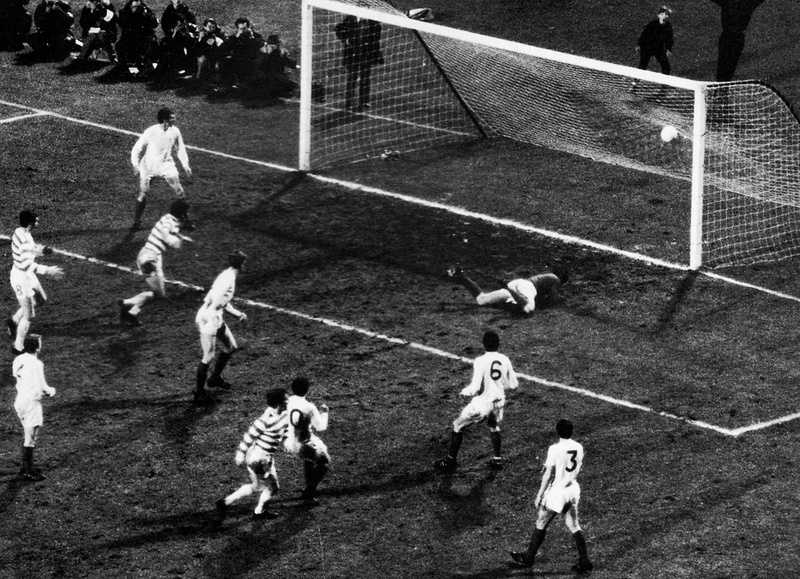 With just a dozen minutes remaining, Bobby Lennox fired home to double the Scottish lead and surely lock out the game. The Scots certainly thought so. Now seemingly secure in the victory, the game was slowed down to a walking pace as the dark-shirted players indulged in a period of keep ball. McCalliog back-heeled the ball to Law, who then did the same, passing possession on to ‘Slim Jim’ Baxter on the left side of the field. Receiving the ball, and bereft of any pressure from English defenders, Baxter flicked it nonchalantly into the air; once, twice, three times, four times, he juggled it with his left foot as he ambled forwards, socks rolled down to the ankles, before caressing the ball back under his control. A pass slipped through to Law then saw a chance on goal. Had the opportunity been taken, it may have gone down in history for the contemptuous arrogance of Baxter in the build up. The midfielder was in his pomp and apparently continually demanded, rather than called for, the ball to be played to him. “Just give the ball to me,” was the apparent insistent and consistent call from Baxter according to the Daily Record when they delivered a review of the game in early 2017. The Scottish fans watching were doubtless in raptures at the show of confidence, but manager Brown was less so. He probably knew a little more than the fans as, just a few moments after, an overly relaxed Scotland conceded. Jack Charlton had been a more than a troublesome thorn in the side of the Scottish defence, despite his troubled gait, but a measure of revenge was secured when the big centre-half scored with six minutes to go. The goal may have encouraged England, but just four minutes later, debutant McCalliog crowned a fine display by scoring the third goal for the visitors, and when Geoff Hurst nodded a second for England with just a couple of minutes to play, there was little time for England to strike or for Scotland to worry. When the whistle went for the end of the game, few would doubt that Scotland had deserved the victory, although it may not have been the barnstorming performance it later came to be painted as. The Scottish fans that invaded the pitch and danced around, tearing up pieces of turf as mementoes, would have little care for such sober reflection, though. In truth, it had been a strange game, often played almost at walking pace. A hobbling Charlton had caused more problems than an injured centre-half, thrown forward as a desperate measure, surely should have done. Yes, Baxter had strolled around the pitch like a conquering monarch taking a tour of his territory, but despite claims by Gemmill in his autobiography that England had been “massively outclassed” and that the Sunderland player had been “the main man”, with Gemmill going on to declare that he couldn’t “remember him misplacing a pass all day”, Baxter had hardly been the best player on the pitch. Aside from the keepy-up session that had magnified his contribution, he had a fairly ordinary game and was eclipsed by McCalliog and Wallace in the Scottish engine room, and by Bobby Charlton trying to drag his struggling team into a contest that they never seemed to engage with. The 100,000 crowd, reportedly including some 40,000 Scots, appeared to take a similar attitude. There was no incessant roaring on of the teams as would perhaps be imagined in such a fratricidal collision. Only occasionally did chants of “Scotland, Scotland” emanate from the crowd and a couple of choruses of “Easy, Easy” arose when the game seemed won. Otherwise it was disconcertingly sedate backing. Scotland pocketed the victory – and any boxing-inspired claim to the world crown – and headed back north to the sort of heroes’ welcome that demanded their victory become legend. Of course, victory over the Auld Enemy was something to treasure, and when that also means beating the world champions on their own pitch, you can ratchet up the glory another few notches. They had brought England’s 19-match unbeaten run to an end, and done so with a victory that was clearly deserved, no matter what credence is given to injuries either real or merely proclaimed. At the end of the day, however, Scotland had landed a punch on England and not a knockout blow. The following year’s Home Internationals, which provided the second half of the qualifying tournament for the European Championship, saw England prosper. A 1-1 draw in Glasgow, after Scotland had slumped to defeat in Belfast, closing things out, sending the World Cup winners off to Spain. It would be another seven years before Scotland qualified for a major tournament. It would be obtuse to say that the game meant more to Scotland than to England; obtuse, and probably a little insulting to the players wearing white on that day. Scotland had played well – more than well enough to win the game – but having done so, it was surely time to kick on from there and get the job completed by topping the qualification competition. That they didn’t, especially with the crop players available to Brown, is perhaps worthy of lament more than celebration. As with the triumphs against the odds when playing the Netherlands in 1978 and 2003, this was another one-off game that promised much but in the end delivered little. The team that defeated England had four players who would become European champions a month down the road, with a further three from the same club waiting in the wings. The Rangers pair of Greig and McKinnon would also contest a European final shortly after, failing to overcome the might of Bayern Munich in the Cup Winners’ Cup final. 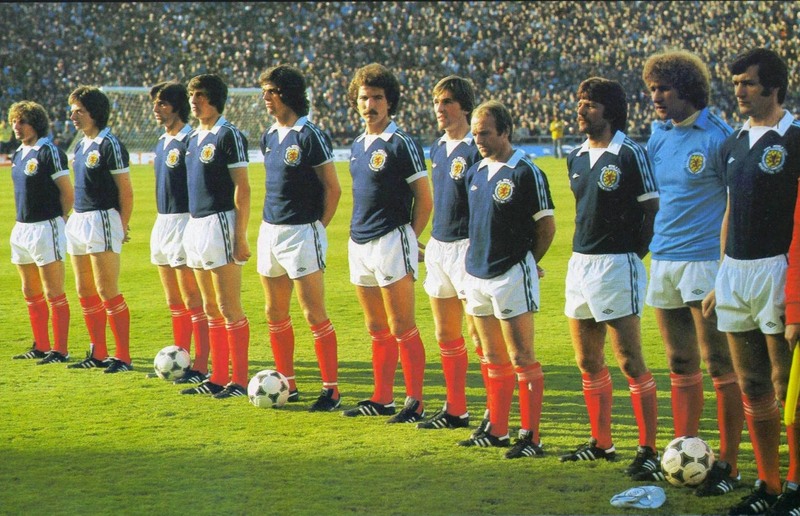 The Scotland team that day was brimful of talent and even more so with promise. It was sadly a promise that remained unfulfilled. Having a day of glory is fine, of course. We all enjoy a day in the sun, but it should have merely been an hors d’oeuvre for a banquet that was to follow. In their next fixture, Scotland lost 1-0 to Billy Bingham’s Northern Ireland in front of 55,000 fans in Belfast, and any pretensions to being world champions evaporated like so much Scotch mist.